This groom is all decked out in his firefighting gear and climbing a ladder to get to his bride. 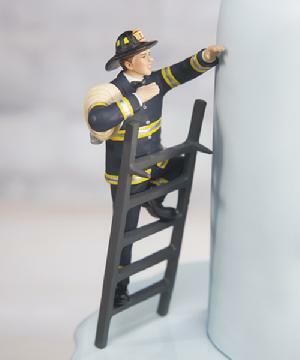 He is held in place by two pegs on the ladder so simply lean him up against one of the bottom tiers of your wedding cake and he is all set to rescue his bride. Mix and match with any of our individually sold brides. Hand Painted Porcelain. 16cm tall.